ADMAF showcased a selection of artworks by Emirati and UAE-based artists reflecting the core values of the late Sheikh Zayed bin Sultan Al Nahyan at Abu Dhabi Art. The pavilion was centred around Zayed: The Soft Power and commemorated five of the core values that honour the Founding Father’s legacy: Wisdom and Peace, Tolerance and Respect, Sustainability and Environment, Human Development and Knowledge, and Unity. 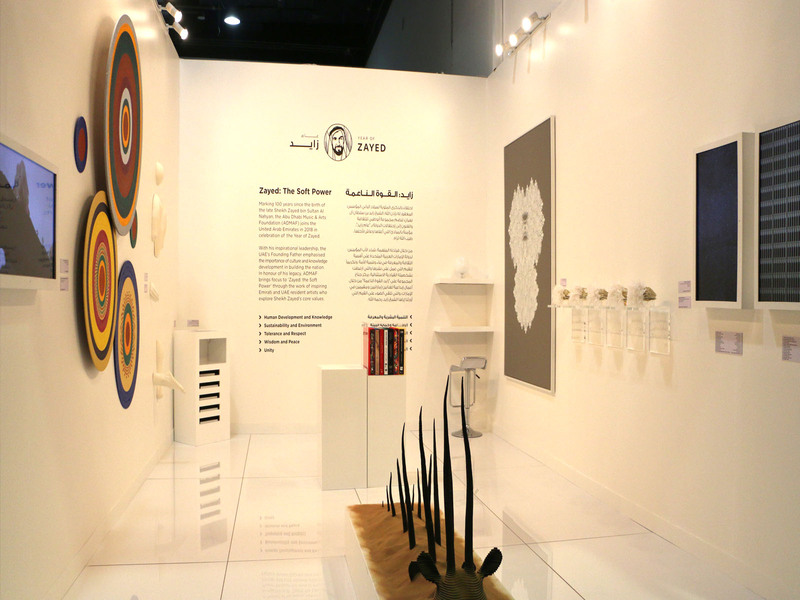 The ADMAF Pavilion featured artworks by Abdelghani Al Nahawi, Ebtisam Abdulaziz, Dr. Ahmed Al Faresi, Nayef AlBalooshi, Maha Ali Abdullah, Hussain AlMoosawi, Patricia Millns and Ranim Orouk, resulting from an open call where artists across the UAE were invited to submit works they felt fitted the chosen theme. The pavilion also allowed art lovers, artists and collectors the opportunity to network through an engaging and in-depth programme of events, tailored to suit all ages.